1993 Miata.. 1993 Ford GT Mustang EFI 5.0.. rebuilt C4 auto, T-Bird rear end with replacement axles as part of "Monster" conversion kit. about 80,000 - 85,000 undocumented miles on motor. ~ Body add ons - flares, spoiler rear, One day paint. ~ AC less than a year old, using existing Miata controls and ducts. ~ originally T-5, I had converted to C-4.. I should have everything to re-install T-5 other than clutch and drive shaft. ~ ** New tags, but I think smog is going to expire this month ? ~ dynamat sound proofing under carpet. ~ cheap stereo with remote a few years old. ~ build book started by owner before me. ~ I think I got it with about 160,000 mile on speedometer. Last edited by dcMiata; 02-04-2017 at 11:08 AM. Who did the actual build? Was it you, Monster Miata, Panache, Bishop, me (pretty sure not) a reputable tuning shop, etc. What type of suspension is it running? 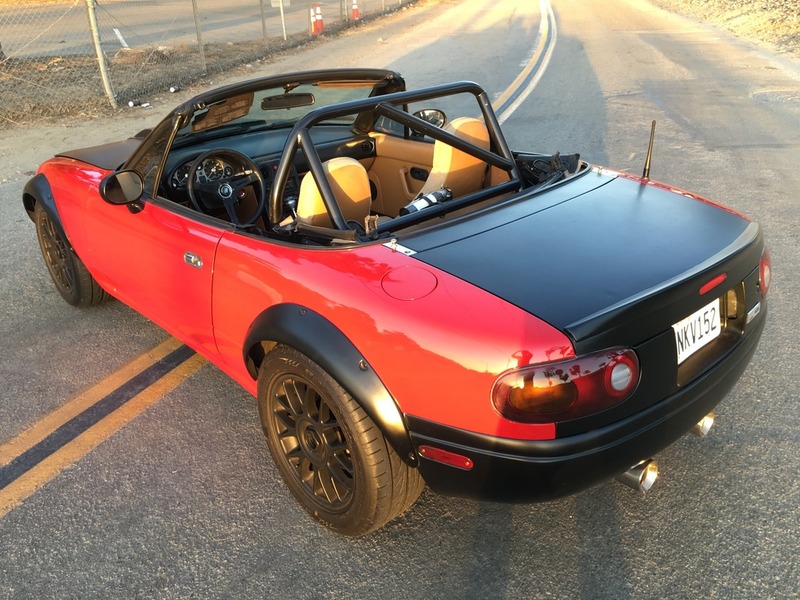 Does it have the "stock" Monster Miata front springs with stock struts, a coilover setup, etc.? Is the title clean or did it start as a reconstructed car? Thanks for posting it up here for our members to look over. Once you've added the above I'd be more than happy to remove this post if you'd like me to. 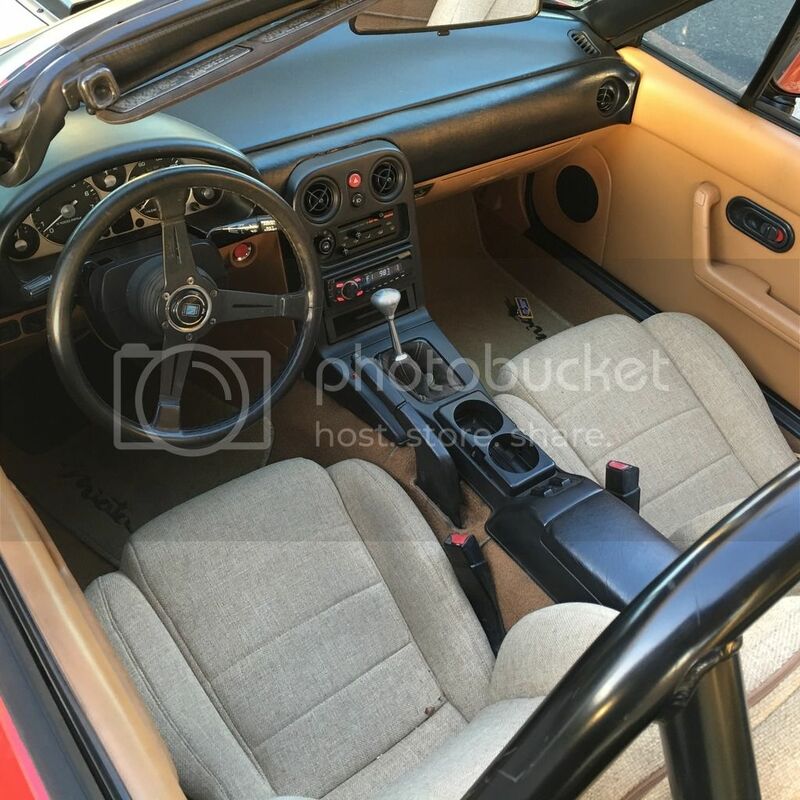 Pictures from all four sides, engine compartment pictures, chassis front and rear pictures? Pictures of the exhaust used, headers back? Details on the rest of the mechanicals and what has or has not been updated? Have the quarters and fenders been cut and or modified for the flairs (beside the obvious holes for the bolts)? Pictures of those areas as well? Are the hood and trunk wrapped or painted? Any rust, previous rust, and/or accident damage? Going to take a lot more than two pictures as a basic response or description to sell your car here (or elsewhere), as we know the difference in the build(s).....Same goes for the above just to justify your higher than current market asking price. Hi, I will try to answer some of your questions, but I can't answer all. I did not build this car, I got it from the builder who had assistance from Monster as I understand. I do not have all documents, but I do have the build manual from Monster. I have owned this car since 2009 and not being a hands on car guy I have spent most of the money at the shops sorting out the things that come with a build as this trying to make a reliable driver. I planned to have a track/street car, but gave up the track idea for a good driver. *The front springs and coil-overs were replaced as part of kit. *The car has 176k miles and the running gear has about 80k undocumented miles. *No rust Calif. car, no accidents to my knowledge and nothing to indicate any. *I have put about 10k on the car since I got it. *Paperwork indicates a 2008 build. *As I understand the value in this car 1} Calif. B.A.R certification and well documented with the state and it can be very difficult to get titled. Many of these builds have been sold out of state, because they gave up trying. If your not in Calif. that's not so important 2} well sorted over the last 7 years. *A buddy is helping set up this post and we are finding it difficult to download pictures, but continue to try ? *I find it hard to find an average price and thought it was priced well with all the extras and understanding it is an OBO. *If you send phone number I will call and try to answer more of your questions. *Stock 1993 Mustang GT engine, rebuilt C4 and all serviced with any problems addressed. *What do you consider a average price ? Last edited by dcMiata; 02-04-2017 at 07:51 PM. I think your price is right in the ballpark. If it would be easier for you feel free to email me some pictures at [email protected] and I'll put them up for you. Ryan tells me the pictures of the car with the flares and bumpers painted red are the most recent. Please contact him with any questions or offers, I'm just the guy posting up his pictures. Is the car still for sale? If so, are you still asking $14,500, and is it located in Redondo CA? When I click the link, then ALBUMS, there are 2 screens of albums but not one with that name. I believe I may have been the builder of this car. I see some things that look familiar such as the rear end, exhaust, and hood but some things have changed as well. I will have to find the VIN and see if it is my old car. I loved this car. I am the buyer. I love the car. I use it as a daily driver and take it to car shows.